Pour the vodka, gin, rum and triple sec into a glass with ice. Almost fill it with sweet and sour mix. 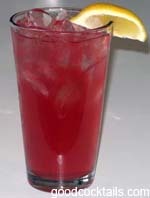 Add the splash of cranberry juice.